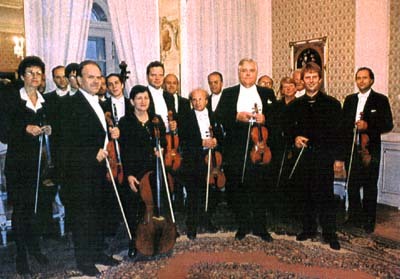 The chamber orchestra Musici de Praga was founded in 1966 by the violist Jaroslav Stepnicka and nowadays belongs to the leading czech chamber orchestras. Musici de Praga interprets classical music of all styles and its main feature is playing without a conductor. This orchestra has visited the most European countries and has performed its concert programs in a number of international music festivals. Besides these activitis, Musici de Praga is also working on the joint projects with Radio and TV broadcasting companies and CD producers in the Czech Republic and abroad, as well. The CD "Baroque concerts in Prague", made in France, recieves in Paris very prestigious prize "Grand Prix de'l Academie du Disque Francaise" in the year 1989 under support of M. Jacques Chirac. At the present time Mr. Jan Pellant is the artistic leader and concert Master, who had many places of work all around the world: Japan, Portugal, South Africa in the same function as he is working now. Repertoire and program of the Musici de Praga is formed nearly from all the classical composers of 18th and 19th century (largely J. Myslivecek, W. A. Mozart, J. Haydn and of course composers of 20th century, i. e. A. Dvorak, L. Janacek, P. I. Cajkovsky and many others).